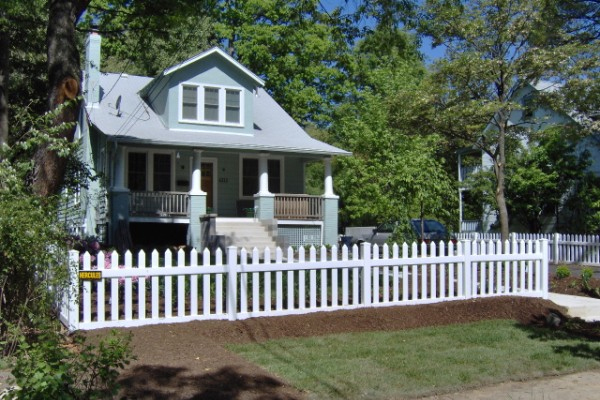 As the largest residential fence company based in Northern Virginia, Hercules Fence is well-positioned to meet your fencing needs. Click Here to browse our vast residential fence options. Over the past 50 years, Hercules Fence has developed a strong reputation for professional service and quality installation. Perhaps best of all, because of our size, we have the luxury of purchasing the fence you want at a price you will love. Not sure what you want? Don’t worry! The helpful sales team at Hercules Fence will walk you through the process, outlining your many options, to help you choose a fence that meets all of your needs: aesthetics, security, and, most importantly, affordability. Wood fencing provides a natural and rustic look to complement your home. Our sales team can offer you many selections to choose from to accommodate your privacy, semi-privacy, and decorative needs. We pride ourselves in our extensive styles and options of wood fence. Our steel products are coated with an electrostatically applied powder coating to create a durable and long lasting finish that will outperform any painted fence, guaranteed. That is why we are confident to offer extended warranties of 12-15 years. Hercules Fence is proud to be one of the top dealers in the country for Aluminum Fence. Our aluminum fences looks great with any style home and complements beautiful landscaping while not limiting a picturesque view. Vinyl fencing has become very popular because of its clean appearance and long product life with minimal maintenance. You will find our Hercules PVC product to be tough and durable, without comprising any aesthetic appeal. These fences won’t warp, rot or splinter. Both durable and affordable, vinyl coated chain link fences are the go-to option for the cost conscious homeowner. Standard colors are black and green, although unique colors are available with a fee for set-up on the coating line. Let us earn your trust and your business. We promise you will not be disappointed. In the meantime, if you have any questions about Residential Fence construction, please contact Hercules Fence of Northern Virginia today by calling (703) 551-2609 or visiting our website. Also, check out Hercules Fence of Manassas on Facebook, Twitter, Google+ and YouTube! This entry was posted on Friday, September 26th, 2014 at 6:12 pm. Both comments and pings are currently closed.